Friends… the one with The Salford Crew! 14-years ago, I began studying at the University of Salford (Manchester) along with four of my closest friends who remain so to this day. Although we were on different courses, the five of us instantly hit it off after joining the university’s LGBT Society. Naturally, I was the Social Secretary. Yesterday evening, Keith, Bren, Dan and I bid farewell to Sarah one of the original 5-star, who moves to Perth, Australia this coming Sunday. Our group of friends has however grown considerably since our university days, along with my waist. The five of us though have experienced so much together since the late 1990s that it’s impossible to sum-up here, but includes a birth, deaths and marriages. We may be getting older, but our bond is still as strong. I know the four of us, wish Sarah (and John) the very best of luck down under. I’ve been to Perth, so know they’ll love it. I was trying to think of the most memorable photograph of the five of us during our tenure together, and found the frontrunner. 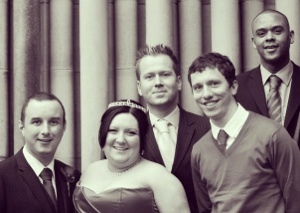 The photo attached was taken back in 2008, on the day of Sarah’s wedding to John. It weirdly was the same day I left for my new life in London, leaving Manchester and my friends. We may be moving to places faraway from each other, but when it matters we will always be there for one another like we have been. The proof is in the pudding as they say, hence it’s now some 14-years later. I remember the day of Sarah’s mum’s funeral, was the same day my mum died. Dan and I bought our flats together, in the same building. Bren and I being Scousers, have always had a close bond keeping the Liverpool dream alive within the group. I’m not one for telling my friends publicly I love them as I wouldn’t want them to think I actually like them, but I do. They’ve been the best of friends, forever. This has been a…g’day Australia, you’re lucky to get Sarah, ‘View from the Bottom’. ← Police Fed my hand, but had bites before!